April 15, 2011: I have long heard of people snowmobiling to Horsepasture Pass north of Eureka Summit. I had skied a lot around Eureka in the past, but I had never made it over Monument Ridge and up the Little Nelchina River to the Horsepasture Pass area. So that became my goal for this ski trip. The last vestiges of winter skiing conditions were holding on here - newish powder on top of granularized snow. These snow conditions made for good skate skiing on snowmobile trails. The amount of snowmobile trails and routes in this eastern area of the Talkeena Mountains, and to the north of the Eureka Summit area, is mind-boggling. Even by using a snowmobile it could take years to explore all the trails in this area of Alaska. 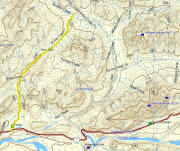 This link shows a map with a few of the trails in the Eureka area. 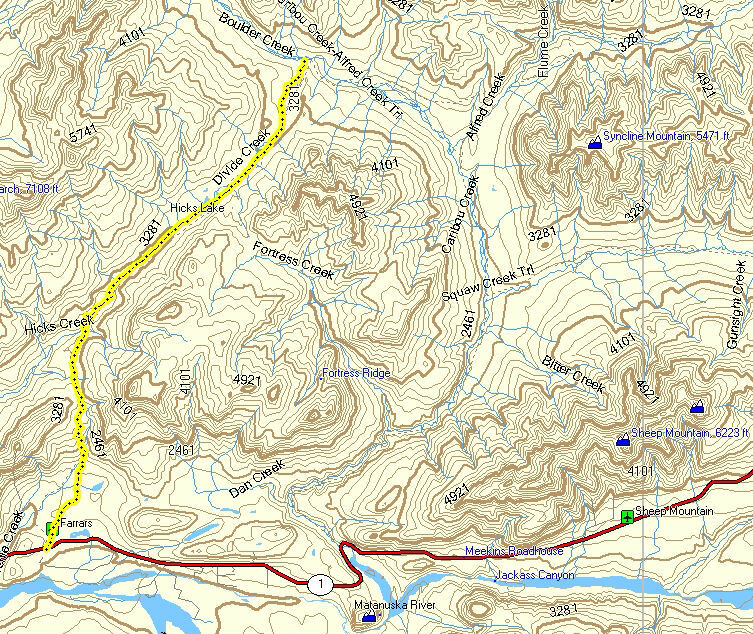 GPS track: 63 miles. No clouds, little wind, cool temps ... this is gonna be a nice day. Furry footed lynx tracks. "Four corners". Trail to top of Monument Ridge can be seen in the distance. 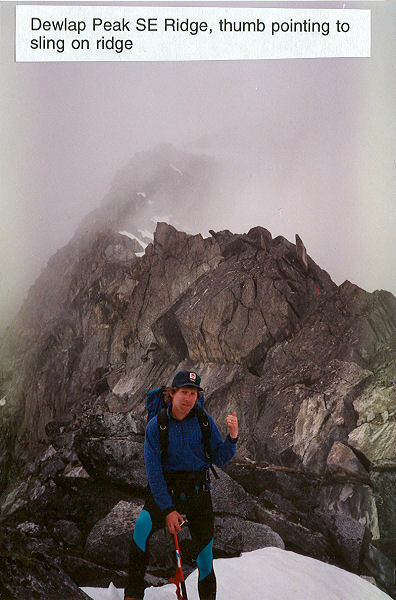 Nearing the top of Monument Ridge. View from on top of Monument Ridge. 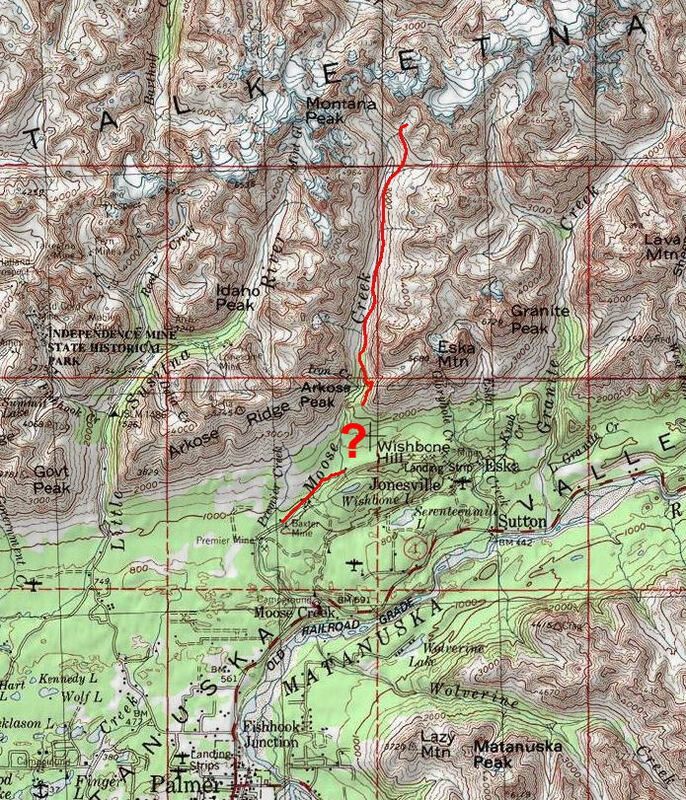 Red arrow points to approximately where I'm heading - Horsepasture Pass. Nice skiing on top of the ridges. Going off the back (north) side of Monument Ridge you shed a lot of vertical in a hurry. Little Nelchina River valley. Willow branches chewed-up by a porcupine. The upper Nelchina River Valley is beautiful, but not the most exciting skiing. Lower down on the Little Nelchina River there was this striking bluff. There was nothing else like this in the area, so this feature really stood out. On a few sections of the "Outer Loop" trail there were places where miners hauling equipment with tracked vehicles had trashed the trails. But this was minimal. For the most part the snowmobile trails here make for beautiful and great spring skiing. For people that have never skied to Portage Pass and wonder what the ski route is like, this picture pretty much shows the whole route. You start at the far end of Portage Lake and then ski to the red arrow. 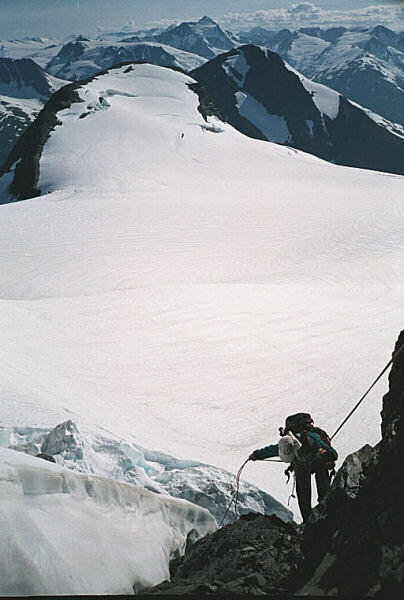 Portage Pass is a fun and safe ski destination. 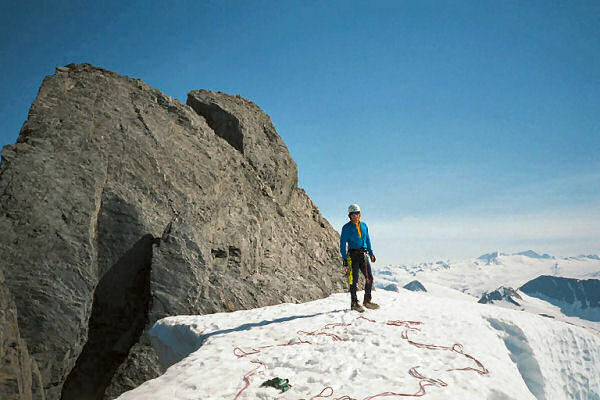 But skiers should be aware that to the south of the pass there are big cliffs that would hurt to fall off. Answer: The main differences between the two pictures are the old fuel tanks showing in the 2010 picture, and no tanks showing in the 2011 photo. During World War II the military built fuel storage tanks here and they were connected by a 50 mile pipeline to Anchorage's Fort Richardson Army base and the Elmendorf Air Force base. The fuel tanks were put here because Whittier is a deep water port, and Anchorage was not. So it was easier for tanker ships to offload here. Also, with the fuel tanks being in persistently cloudy Whittier the Army figured it would be tougher for Japanese fighter planes to find them and bomb them. For around 65 years these tanks were standing here until they were dismantled this last year. Mid April 2011: If you crust ski at Portage Lake ... ... you might want to stop in Girdwood on your way back and check out the brand new xc trails, north of the main lodge. They are not complete yet, but 3 kilometers are groomed for out and back skiing. Shade from the trees slows the snow from going soft, so it will likely be good skiing here after you ski Portage. Early April 2011: You'd think that near-record low snow depths for this time of year would curtail skiers from knocking out new crust skiing routes. 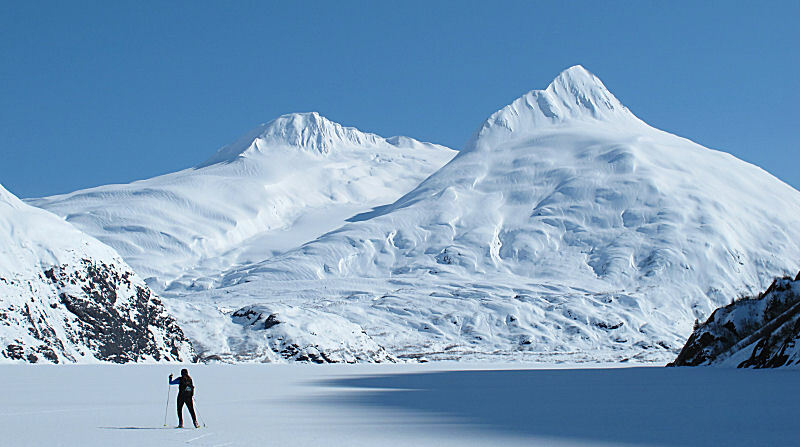 But lack of snow is no factor to Dante Petri and his crust skiing pals on the Kenai Peninsula. Recently Dante and crew got some new ski routes in that I've never seen done. Check it out here. Dante spends a lot of time in the backcountry cruising on most anything that slides - skiiny skis, fat skis and snowboards. And he does a great job of photo-documenting his outdoor ventures on his blog: "A Trail Called Life." The fact that Dante writes for a living also shows in his blog ... it's well written stuff. One of my favorites from his blog is last year's July ski descent of Mount Ascension above Lost Lake. I found out this year that Dante grew up in the same small town in Vermont that I grew up in ... so he's a cool dude in my book! Photo of Dante, from Dante's blog. 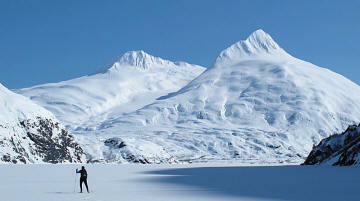 Late March 2011: I had not skied much to the west of the Forks Roadhouse and the Peters Hills. So I decided to check out the Collinsville Trail. 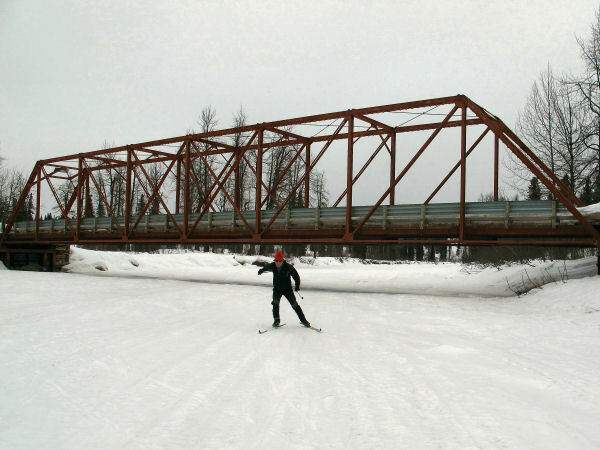 I skied out 27 miles to the west bank of the Kahiltna River, and then skied back. This was a neat area with trails that skate ski well. I need to go back and ski-explore trails that go west beyond the Kahiltna. 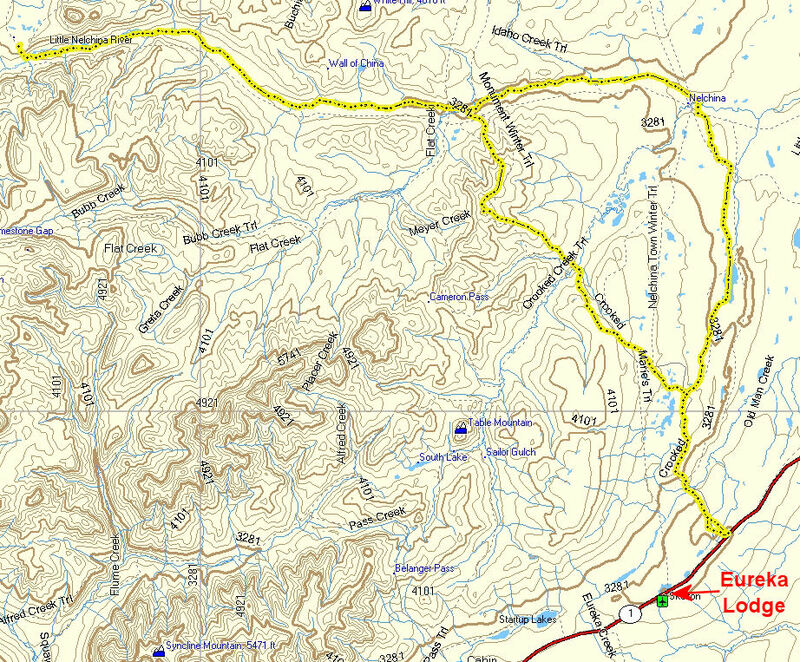 GPS track: 54 miles RT. This is not THE bus. The "Into The Wild" bus is up north near Healy on the Stampede Trail. So I guess this is a WANNABE bus. The sign may be grammatically challenged, but it is pretty damn funny! Going straight past the Forks Roadhouse ... ... and across the iron bridge over Peters Creek. The Curry Ridge Riders did some test grooming west of the Forks Roadhouse. If they have the money next year they will regularly groom this area. On the Peters Hills plateau the Collinsville Trail turns to descend to the Kahiltna River at this glacial erratic. A wolf's "pee tree". Usually this area would have 4 or more feet of snow this time of year. But not this year. There was not much of this tundra skiing. But skiing downhill on smooth tundra is kinda fun. I really liked the trail that descended to the Kahiltna River. Very skiable. But it was a grunt coming back up. The trail abruptly dumps you onto the Kahiltna River flood plain. Near the west bank of the Kahiltna River. A nice day ... in "A" "K". In the distance, above the brush, you can see the Kahiltna Glacier. On the Kahiltna River flood plain there were wolf tracks everywhere. 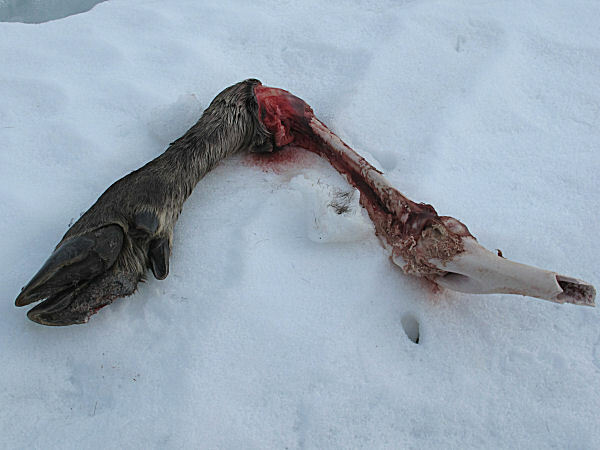 And so were signs of what they had been eating - moose. I'm always picking up stuff people drop on snowmobile trails. This Polaris windshield fastener (r) will come in handy. Buffed out trail heading back to the Forks Roadhouse. I started out this picture series with death-related pictures. So I will end it with another death-related picture, only this one is real. The picture above shows the site where two snowmobilers, a man and a woman in their early 20's, were killed on the Petersville Road. This site was a mile from the start/finish of this ski trip. The snowmobile flew off the road here and crashed into these trees. Troopers say that alcohol was a factor in these deaths. Update: Early April 2011: My wife and I went back on this route 5 days later. Our intent was to use a snowmobile to go west of the Kahiltna River and set up a base where we could ski-explore trails for a couple/ few days. But when we go to the Kahiltna River there was newly-formed deep overflow on the river and we doubted we could safely get across by skis or snowmobile, especially in the days to come given the warm temps. We didn't want to get trapped on the west side of the Kahiltna, so we played it cautious and turned back. Oh well, looks like I'll have to try again next year. And hopefully next year will be a better snow year in Southcentral Alaska than this year was. GPS track: 30 miles RT Driving through Palmer. Start of Hicks Creek Trail. Route goes through pass in the distance. There are some steep sections getting up to the pass. The climb to the pass follows an old mining road. Above tree line, nice views of the main Chugach Mountains. Up higher in the valley there is good skating to Hicks Lake. The Divide Creek - Caribou Creek confluence was a complete overflow mess. You have to be careful you don't slip, fall and start sliding downhill on this ice. A snowmobile suspension bolt. Not a good thing to lose in the mountains. A few wolves roam this valley. Some of them are pretty big. It's spring time and the mountains are thawing out. So be alert when driving, especially at night. March 13, 2011: I had heard of snowmobilers going up Bald Mountain to the east of Talkeetna. So for quite a while this had been a place I wanted to ski to and check out. Though the snow conditions were nothing to brag about, this was a scenic and fun ski to a place I'd never been to before. This winter I wanted to become less ignorant of the trails to the east of Talkeetna. After 4 trips this winter to this area I now know a lot more about the trails of this locale. But there is still a lot more for me to learn. 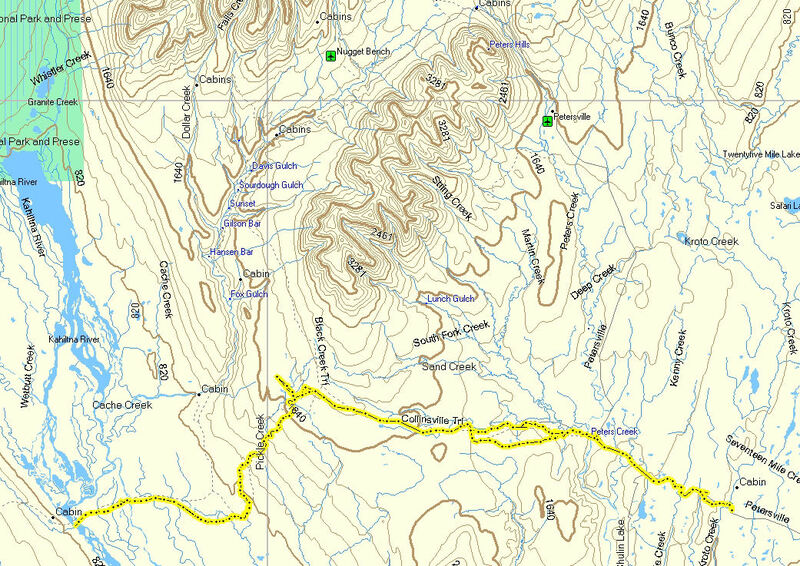 Location of Bald Mountain east of Talkeetna. A steep section line trail led up to the high country. Snowmobile tracks heading for Bald Mountain. Thanks to 3 weeks of strong winds - lots of sastrugi and wind-skank snow. Communication station stuff on top of Bald Mountain. View from on top of Bald Mountain. Airstrip on top of Bald Mountain. Cold on top. Last look before heading down. On a distant ridge I was surprised to see a cabin (on ridge to the left) I had to make a detour to check it out. This private shelter cabin has an unencumbered 360 degree view. It's likely the best view from a cabin I've ever seen in Alaska. For the 360 view click here. Early March 2011: It took me 4 tries, over three years, to ski from the Buffalo Mine Road to the Mountaineering Club of Alaska's Dnigi Hut and back in a day. Why so many tries? Access confusion. Recent development at the end of Buffalo Mine Road has changed the access to Moose Creek from the way it was in the 90's. And it took a while to figure out a route that circumnavigated the new "Private / No Trespassing" signs. But I'm still not sure if I was on the "official" access and not trespassing. That's why in the map below I put a question mark on this area. I don't want to mistakenly suggest that people ski across private property. It was gratifying finally pulling this ski trip off. And it happened on a beautiful day. I followed snowmobile tracks up into the Moose Creek drainage. The tracks eventually became faint as a result of the endless winds we have been having. 4 miles from the hut I made my own route that climbed up to the hut. Breakable wind-crust made the going a bit slow up high. So I had to hammer to get to the hut and back before sunset. I wouldn't have had to hammer if I had started early instead of 11:00 AM (note to self). The last log book entry was September 2010. It didn't look like the snowmobilers whose tracks I was following made it to the hut. Note: If you join the Mountaineering Club of Alaska ($15.00/year) you get to use their huts for free. And your money helps maintain the huts. Plus, by joining you get access to the monthly Scree newsletter and you also have access to the part of the MCA website that has GPS locations for all the huts. Good deal for $15.00. Route: 26 miles. "?" = area of questionable legal access. OK, I get the hint. Stay out. The main trail went right next to this new cabin and airstrip under construction. Hmm. Probably not the right way. Looking up Moose Creek Drainage. To get down to Moose Creek there was an extremely steep hill through the alders. This picture doesn't do it justice. Heading up a blown-out snowmobile track. Snowmobiles are good at finding the soft spots on creek trails. Wolfie tracks. Ptarmigan landing skid tracks. There were a few gullies I had to contend with to get to the hut. Nothing too bad though. Headwaters of Moose Creek. The area where the MCA Dnigi Hut is located is noted. Getting close. "Dnigi" means moose in Dena'ina Athabascan. My first visit to the Dnigi Hut. I had climbed in this valley several times before the hut was built. The hut was in good shape. The door has a small leak. I cleaned out the snow. Funny pictorial addition made to the hut log book. Snowmobilers figured out they could ride to this hut shortly after it was built. This panoramic is from near the Dnigi Hut. You can see the hut to the far left. Moose Creek, where I came up, is beneath the sun. There was a nice drawing of the hut posted inside of it. Saying goodbye to the Moose Creek valley. A few rough spots on the Buffalo Mine Road. But challenging trails are part of the game of constantly trying to ski to places you've never skied to before. The last time I had been in the Moose Creek valley was 15 years prior when these pictures were taken. When I heard that the Dnigi Hut was to be built in the mid-1990's I got anxious. 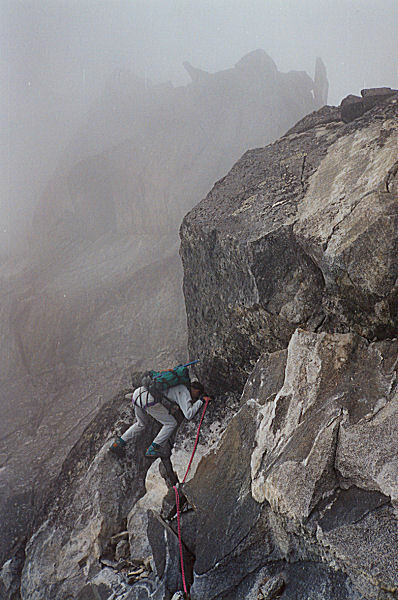 I knew there was an unclimbed peak near where the hut would go, and it needed to be climbed before access got easy. So I bugged Bill Spencer until he would go with me and give this summit a shot. He went and we made it to the top. 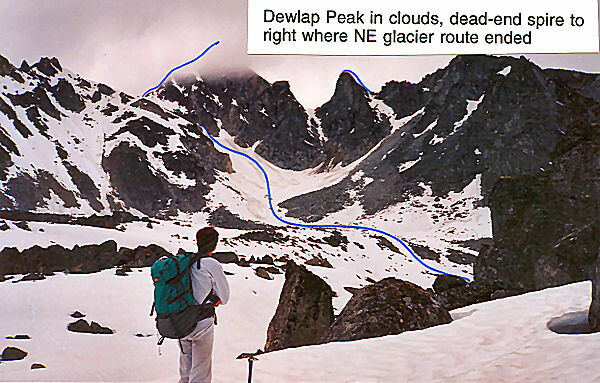 Bill came up with the name of this peak: Dewlap Peak. A dewlap is the appendage that hangs off the neck of a moose, and this peak is at the head of the Moose Creek valley. Looking at these pictures makes me realize how life as an Alaska xc ski racer has changed enormously in the past decades. 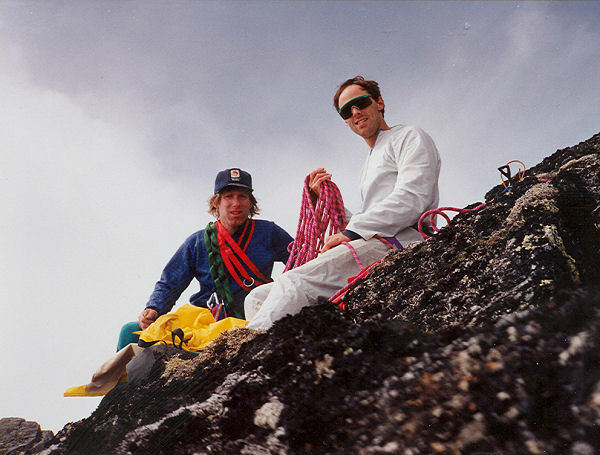 Bill and I would do climbs like this, 24 to 30 hours of exercise and full-on adventure in a weekend, regularly. We looked at it as ski training. Nowadays ski training more resembles a life of a monk where a ritualistic daily routine / training recipe is set out and followed "to a T" year-round. This might make ski racers a little bit faster, but they sure miss out on many years of great outdoors adventures. Update: I got an email asking what the heck Bill Spencer is wearing. A white haz-mat suit? Actually Bill made that suit. For the Cross Pass Crossing foot race (of which Bill once owned the record) you have to bring top and bottom wind resistant garments. 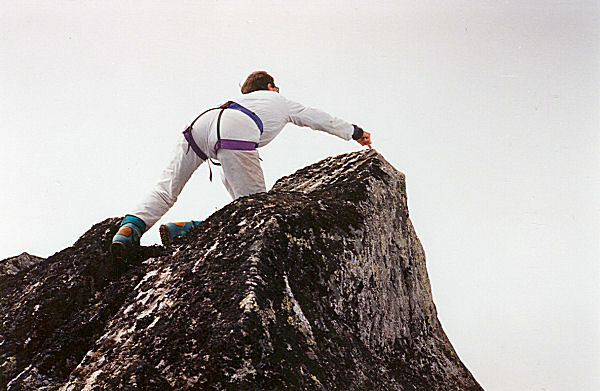 In the early 90's Bill got the idea that he could save a few ounces by making a one piece suit out of thin nylon fabric. And so he did. I believe he carried it when he set the course record. 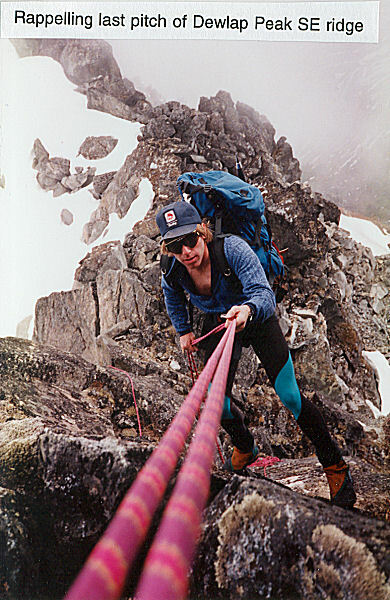 After its Crow Pass debut Bill's suit went on to set the fashion standard for Southcentral Alaska peak baggers! Early March 2011: One way to check out new country and get some skiing in is to head off riding double on a snowmobile, and then take turns skiing sections of a loop. Recently a planned ski trip didn't pan out so my wife and I grabbed our snowmobile and took off from Alexander Creek to the Talachuitna River, down the Swentna River to the Yentna River and then back to Alexander Creek. This was a 140 mile loop done in a day. On sections such as Alexander Lake to the Talachuitna , the Tal Vista Lodge Trail to Swentna, the Skwentna River and upper Yentna River we took turns getting in some skiing. This is a fun way to cover a lot of ground, see new country and to ski some new trails. My camera is on its way back from repairs at Canon. And our backup camera had battery issues. So ... not many pictures this trip. On another ski trip recently I incorporated a stop at “Scary Tree” at the confluence of the Yentna and Big Susitna Rivers to watch the passing of the Iditarod mushers. What a spectacle. Not the mushers, but all the people. Thousands of spectators on snowmobiles, grouped around endless bonfires – laughing, cheering, eating hotdogs and drinking. Overhead: an unbelievable amount of helicopters, small planes, ultra-lights and even powered paragliders buzzing back and forth. As the mushers passed there were several instances of dog teams veering into the crowds as the lead dogs bee-lined towards tables piled with hot dogs. It was one crazy, huge party. Only in Alaska! It was fun to witness this madness with my neighbors from Alexander Creek. One last note: I lost track of the number of times in the above two ski treks that I was buzzed by small planes. It seems like there is a law in Alaska that if you own a Super Cub you have to fly 10 feet over the head of any skier you see on remote trails. Super Cubs are the "Mosquitos of the Iditarod". When it's Iditarod time they are swarming all over the place. It's pretty entertaining when these planes buzz over you ... just as long as you don't get a haircut by a propeller! Skiing the Tal Vista Lodge trail west of Swentna. Beluga Mountain is in the background and way to the south is Mt. Susitna. A nice section of the Tal Vista Lodge Trail on the Swentna River. Note the groomed trail. This is about 120 miles from the nearest road system trailhead. My wife skis past Joe and Norma Delia's cabin at Skwentna. After running the Skwentna Iditarod checkpoint out of their home for 39 years, the Delias are selling their place and moving to the road system. Luce's Lodge is always a magnet for Yentna River travelers that are feeling hungry.